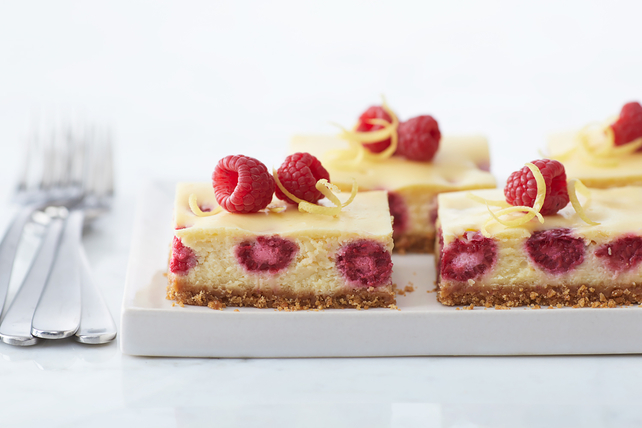 If you like cheesecake, you're sure to love these Fresh Raspberry-Lemon Cheesecake Bars! The deliciously creamy bars feature the perfect hint of fresh fruit flavour. Line 13x9-inch pan with foil, with ends of foil extending over sides. Combine graham crumbs, 2 Tbsp. sugar and butter; press onto bottom of prepared pan. Bake 10 min. Reserve 1/2 cup raspberries and 1 tsp. lemon zest for later use. Beat cream cheese, lemon juice, remaining zest and remaining sugar in large bowl with mixer until blended. Add eggs, 1 at a time, mixing on low speed after each just until blended. Gently stir in remaining raspberries; pour over crust. Bake 35 to 40 min. or until centre is almost set. Cool completely. Refrigerate 4 hours. Top with reserved raspberries and lemon zest. Use foil handles to remove cheesecake from pan before cutting into bars. Serve these creamy cheesecake bars topped with an easy-to-make fresh raspberry sauce. While cheesecake is chilling, cook additional 1-1/2 cups raspberries and 2 Tbsp. sugar in saucepan on low heat 6 min. or until mixture comes to boil, stirring occasionally while mashing raspberries with back of spoon. Pour through fine-mesh strainer; press to remove all juices. Discard strained solids. Refrigerate sauce until ready to drizzle over the cut bars just before serving.